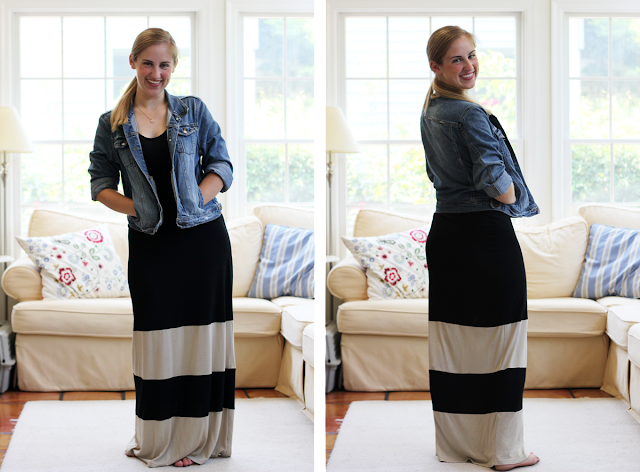 The main thing that I knew I really wanted to add to my wardrobe this summer was a maxi dress. The first time I tried this dress on at Target, they didn’t have it in my size. The next time I was there I looked again on a whim, and they had it! I’m so glad, because this dress is one of my favorite things in my closet. You guys know how I feel about my jean jacket, and when the weather calls for it, I love pairing it with this dress! Did you have something that you wanted to add to your wardrobe this year? Spill! It looks great on you! I don't think I could pull off the maxi dress, but I'm always amazed at people who do. This year I'm hoping to add a classic navy blazer to my wardrobe. They're pricey, so I better start saving now! You look fabulous in your new dress. I've been dying over a pair of swedish clogs for months and I finally bought myself a pair. Boy do I love them. There is a special feeling that comes with buying an item you've been wanting forever and getting to wear it out at last. Cute outfit! I have that same jacket from AE, it's my favorite! I've never tried on a maxi dress before. I'm kind of intimidated but it looks so cute on you! I think I'll try one on for fun and see if I can pull it off! But I'd really like to add a fedora to my wardrobe! I absolutely love this dress on you. It looks great! I've been eyeing a particular maxi skirt from Target but they never seem to have my size… argh! Love the simplicity of that dress! And the colors also. Great find! I wanted to buy a maxi dress, too, but… I'm too short. Whether it's a maxi dress or skirt, they're RIDICULOUSLY long. I'm just worried that if I try to buy one and get it hemmed, it will ruin the pattern or structure. Yup, they're THAT long on me. :-/ But I settled for some lovely teal sandals and my new favorite striped shirt (that I'm wearing today)! You look gorgeous, by the way! You look great in this dress, Kate! I recently purchased one in a similar cut and I think it's more flattering than the big, bohemian flowy ones. love love loooove!! You are too cute. Oh how cute! I just bought my first maxi dress this spring and have fallen in love with how comfortable it is! Very cute! Love that dress! Nooooooo that's the dress I've been searching for for months!!!! Seriously, every time I go to Target they don't have my size. So. Jealous. You. Found. It. Love that dress, Kate! Especially that it is a racer-back.. I love an excuse to wear a sports bra all day. I got a pair of gold Saltwaters at the start of the summer, and they have been a great purchase. I love 'em! A maxi is on my list, too. I'm still on the hunt though. You look adorable – the denim jacket looks great with it! what a beautiful dress!! and I love this room you're standing in!! I totally want that dress! Love that outfit. that dress is so gorgeous! I love how well it sits on you. Total go to piece of clothing. Brilliant! And excellent styling too. i saw this at target when i was home in the states but i could not find my size, i was so sad! I still haven't found the perfect summer dress yet, maybe I should look into a maxi. You look great in it! Looks amazing on you! I am way too short to wear maxi dresses but so wish I could pull off this look. What a versatile and classy looking dress!